Colton’s Map of the States of New England and New York with parts of Pennsylvania, New jersey, the Canadas & co. showing the rail roads, canals and stage roads with distances from place to place. An extraordinarily scarce 1856 Colton pocket map of New York and New England. 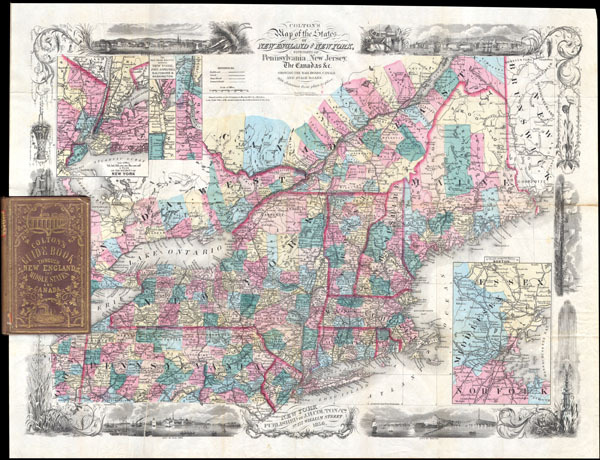 This beautifully rendered pocket map depicts all of the New York and the New England states as well as with much of Pennsylvania, New Jersey, Ohio and Ontario. Inset maps depicts the vicinity of New York City, the Vicinity of Boston, and the railroad connections between New York, Philadelphia, Baltimore, and Washington D.C. Surrounded by a truly spectacular decorative border featuring attractive engraved views of New York Harbor, Boston Harbor, Toronto and Montreal. Right hand border features a view of several sailing vessels and a steam ship. Left had border offers an attractive view of a train passing through a tunnel. Drawn by George W. Colton and engraved by E. M. Atwood. Dated and copyrighted: 'Entered according to the Act of Congress in the Year of 1850 by J. H. Colton & Co. in the Clerk's Office of the District Court for the Southern District of New York.' Published from Colton's 172 William Str. Office in New York City. Very good condition. Minor discoloration and split to fold entering from the right center edge but not extending past the margin. Minor printing error in lower left quadrant extending well into map. Blank on verso. Not included in either the Rumsey or the Phillips catalogues.